Bobby Moakley gives his first address as RIT Student Government president during the recent 50th Anniversary Reunion for the National Technical Institute for the Deaf. Born deaf, Moakley received his first cochlear implant and began learning sign language before he was 2. He used oral speech before coming to college, but said he quickly picked up sign language again as soon as he came to RIT. He prefers to speak orally, but is happy to use sign language more now that he is on campus. He knows there’s a wide range of communication preferences on campus among the students supported by NTID. 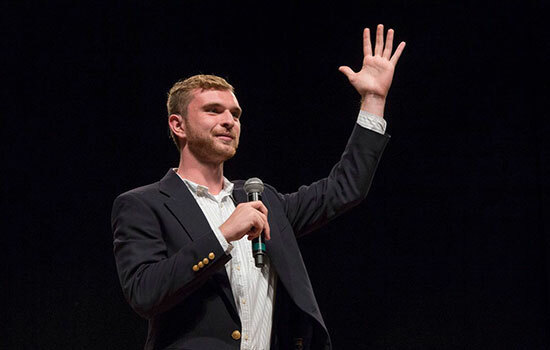 Moakley is the third deaf student to become RIT’s Student Government president. The first two were Lizzie Sorkin in 2006-2007, and Greg Pollock from 2010-2012.